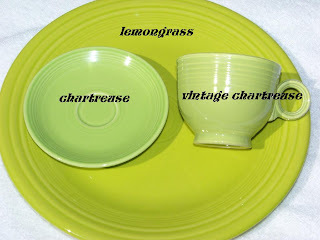 The latest pictures I have seen show a comparison between the new Fiesta Lemongrass, Post '86 Chartreuse and Vintage Chartreuse. The new Lemongrass, appears to have alot more yellow in it than the Chartreuse versions (the Post '86 has the most green, then the Vintage Chartreuse, then the Lemongrass). In my opinion, it is a color that has the most potential to be a hit in the most recently released regular production colors.